On a regular basis we see the benefit of routine vaccination: deadly cases of Parvovirus that could have been prevented, pets who are in quarantine due to expired Rabies vaccine, even cases of Tetanus in large animals. Your pet faces enough threats to his or her health. Preventing the disease through vaccination makes humane and monetary sense. We will assess the risk your pet faces for each disease and will only recommend the vaccines we believe are appropriate. Other: Ferret specific Canine Distemper and Rabies. 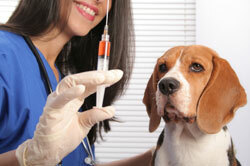 Why should you allow us to do your pet’s vaccinations? Purchasing your vaccines from feed stores and catalogs is risky. Vaccine handling is essential to it’s effectiveness. With a store or catalog bought vaccine you have no certainty of proper storage prior to your purchase. Our vaccines come directly from the manufacturer to us, shipped on ice. We apply strict quality control. Our manufacturers stand behind their vaccines. With store bought vaccines, if your pet contracts the disease they were vaccinated for you have little recourse. Furthermore, vaccines are not benign. They can be at least ineffective if not given properly or can even be harmful to your animal. The small cost savings you may receive from purchasing and administering your own vaccines will not be realized if you have one case of disease breakthrough or complication like a vaccine reaction or abscess. Please contact us if you have questions about your pet’s vaccines.